Faculty members were sent an e-mail yesterday from the Office of the President describing the process for voting to ratify or nullify a Faculty Senate motion passed last month. The e-mail indicates how to cast a vote. The deadline for voting is tomorrow (Friday, March 4) at 5:00 p.m.
Want to know more about tuition remission and tuition exchange benefits for UE employees? Come to an information session where you will learn about the two programs and receive information about applying to UE. There is a session today at 2:30 p.m., in Eykamp Hall, Room 253, Ridgway University Center. Coffee time with the seminarians! Come to Jazzman's every Wednesday from 4:30-5:00 p.m., and meet the Newman Club's seminarians! Ambrose and Tam, our international seminarians, are currently studying at St. Meinrad Archabbey in St. Meinrad, Indiana, and they would love to meet you! Please feel free to come by, say hi, and ask them anything you want! Looking for simple new ways to come closer to your faith this Lenten season? Join Newman Club members Nathan Kabat and Nicolette Fonseca for 20 minutes every Friday at 11:00 a.m. in Neu Chapel as they lead us in the Rosary! We hope to see you there! Please e-mail Nicolette (nf39@evansville.edu) or Nathan (nk78@evansville.edu) for more information! The TIAA-CREF representative will be on the UE campus on Tuesday, March 22, for individual counseling sessions. To schedule an appointment, call TIAA-CREF at 1-800-732-8353 or 317-706-6200. The sessions are held in the Clifford Rare Books Room of the University Libraries (room 158). Each staff employee and their guest are invited to attend the Staff Appreciation Dinner at the Log Inn on Wednesday, April 20. The social hour (cash bar and appetizers) begins at 6:00 p.m., and the dinner will begin at 7:00 p.m. Please join President Kazee in the presentation of staff service awards and for the presentation of the Staff Employee of the Year Award. Invitations will be sent to staff employees via UE campus mail during the first week of April. Please contact Human Resources at ext. 2943 if you have any questions. The Department of Athletics and Office of Alumni and Parent Relations invites Aces alumni and fans to a watch party today at 6:00 p.m., as the Men's Basketball team plays game two's winner (No. 7 Missouri State or No.10 Drake) in the second round of the Missouri Valley Conference Tournament. The watch party will be at Chido Mexican Bar and Grill, located at 701 NW Riverside Drive in Evansville. No RSVP is required. It will be dutch treat with a full menu available. Ever wonder what to do with the T-shirts that just sit in your drawer and never get worn? From March 21-23, you can donate them to AT Club's AT-shirt for Uganda. All of the donated T-shirts will be given to children and adults in Uganda. You can donate your T-shirts on March 23, from 11:00 a.m.-1:00 p.m., and 4:00-6:00 p.m., at a table in Ridgway University Center. For every three T-shirts you donate, you get a chance to make a guess at how many T-shirts will be donated. The winner of that competition will get a $20 gift card! If you have any questions, please e-mail Megan Morris (mm636@evansville.edu) or Hannah Bernhardt (hb92@evansville.edu). UEVETS, the University student veterans organization, is inviting UE organizations to participate in its annual Spare Change for Warriors Bowling Tournament, a fundraiser for local veterans in need. The event will be April 2, at 1:00 p.m., at River City Recreation, located in Evansville on Weinbach Avenue, just south of Washington Avenue. For $100, an organization can sponsor a lane, have its name above the lane on a sign, and guarantee a lane for five bowlers in the competition. Please note that it is possible for organizations and individuals to donate without putting forth a team. Money raised will go to the UEVETS charity - the VFW's Chaplain's Relief Fund - and to UEVETS. In addition, the winning team (five bowlers) will be able to donate a portion of the total money raised to a charity of their choosing! There will also be door prizes provided by local businesses. There are a limited number of lanes so act fast! To register, contact Joel Kaiser at jk283@evansville.edu by March 21. We hope to see you and your organization on April 2 at River City Recreation! 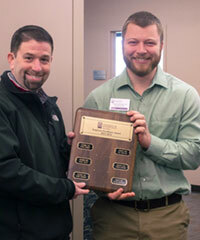 Calvin Wertman, residential coordinator and student life specialist, has received the March 2016 Employee Excellence Award. Since coming to UE in 2009, he has dedicated countless hours to the students and staff that he works with, as well as many others that he lives and interacts with on a daily basis. When Calvin leaves the office each day, he doesn’t leave his work behind. Instead, he spends his evenings helping students deal with the challenges of daily life. Calvin is known as someone who serves others in his daily interactions by being a role model to students, a support system for other staff members, and a resource of amazing wisdom and leadership for those he oversees. There will be no Sunday Mass at Neu Chapel on March 6 or March 13, due to Spring Break. We hope everyone will join us for our next Sunday Mass on March 20 at 1:00 p.m. as we celebrate Palm Sunday. And we hope that everyone has a safe and wonderful Spring Break! The Office of Alumni and Parent Relations has started working on event planning for Family Weekend 2016 (September 23-25.) If your student organization or department would like to have an event for families or parents during this weekend, please complete the "Family Weekend 2016 Event Participation Form" by March 29, by clicking here. Like past years' successful events, we would like to have a lot of student and department participation! If you would like to volunteer assistance, or if you have ideas, please contact us at alumni@evansville.edu or call 812-488-2586. The Fitness Center will close at 7:00 p.m., Friday, March 4. There will be no open swim that evening. Open Friday, March 4, from 6:30 a.m.-7:00 p.m.
Open Monday through Friday, March 7-11, from 8:30 a.m.-6:00 p.m.
Open swim will depend on guard availability. Are you interested in hosting a prospective student? The Office of Admission is looking for current students to help host prospective students on Sunday, March 20, starting at 5:00 p.m. Dinner will be provided. The student staying overnight will be doing their campus visit the following day. If you are interested in being a host, please e-mail Catie Taylor at ct37@evansville.edu with your name, roommate’s name, hall, room number, and cell number. The priority deadline to study abroad at Harlaxton in Spring 2017 is March 7. Applications are available online at www.evansville.edu/studyabroad/harlaxton.cfm. Members of UE’s Black Student Union (BSU) will attend the first Collegiate Black Student Summit from March 4-6. The summit is a national forum where solutions to problems facing the black campus community are discussed and developed. The members of BSU will be inspired and empowered to critically think about their role as agents of change for the University of Evansville. Over 100 students will be in attendance from the University of Rochester (the host university), Harvard University, University of Pennsylvania, University of Connecticut, Ithaca College, Cornell, SUNY Albany, SUNY Buffalo, Syracuse University, and Columbia. University of Evansville and ProRehab sports physical therapy residents had the opportunity to participate in the preseason screening of the Milwaukee Brewers Major League Baseball team in Arizona. 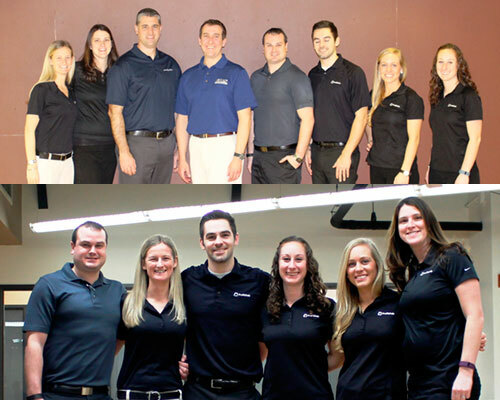 The team was led by Phil Plisky and Bethany Heubner, assistant professors of physical therapy, and included UE alumni and residents Kyle Matsel '11, Frances Matsel '10, Paul Gorman '99, and Allison Weaver '15, as well as current sports residents Sam Callahan and Danielle Honnette. This is the third year the UE/ProRehab residents have participated in the injury prevention system utilized by the Brewers, who have become the least injured team in Major League Baseball since implementing the program. The screening involves specific tests and an injury risk algorithm developed and researched by Plisky and Kyle Kiesel, professor of physical therapy and department chair. This injury prevention model is used by a wide variety of high school, college, and professional sports teams as well as the US Military. UE alumnus Jack DuArte's new novel, Kidnap the Pope, is now No. 1 in the bestseller lists and categorized as a Hot Release by Amazon. Kidnap the Pope is DuArte's sixth novel. The plot of Kidnap the Pope involves Adolf Hitler’s attempts to avenge the overthrow of his close friend Il Duce, Benito Mussolini. It follows the world’s actions leading up to the events that fixed this remarkable story in the classic annals of WWII. DuArte is a historical fiction writer and lives in Lexington, Kentucky, with this wife, Susan. His previous novels are The Resistance, Singapore, Spitfire, Malta, and The White Mouse. Reviews of his work can be found on Amazon, Kindle, and Goodreads. Professor of political science Richard Maass just had an invited book review published as part of a roundtable on the International Security Studies Forum of H-Diplo, the online community for diplomatic history and international affairs. The roundtable focuses on Dale Copeland's recent book "Economic Interdependence and War," which argues that leaders often base their decisions for war and peace on current and future economic trends. You can read Maass's review, along with those of the other roundtable participants, here. The Purple Aces Investment Analysts Team will participate in the CFA Institute Research Challenge on Thursday, March 3, in Nashville, Tennessee. Team members are Ned Bentsen, Ben Philips, Stephanie Comstock, and Joshua Herrera. Their faculty mentor is Walayet A. Khan, research director for the Institute of Global Enterprise and professor of finance. The CFA Institute Research Challenge is an annual global competition that provides university students with hands-on mentoring and intensive training in financial analysis promoting best practices in equity research among the next generation of analysts. The CFA institute offers the CFA certification, the most valuable and globally recognized certification in finance. This is the first time that a team from UE has participated in this prestigious competition. Jaylon Brown and Mislav Brzoja picked up two more Missouri Valley Conference awards on Wednesday as Brown notched a spot on the Most Improved Team and Brzoja was named to the All-Bench squad. Brown saw great improvement this season as he has made the start in all 31 games this season and continues to rank as the No. 2 shooter in the league, hitting 52% of his attempts. His career-best came on three occasions this year as he has notched 19 points. He has averaged 10.5 points per game. Yesterday, Brzoja becomes the third University of Evansville player to earn Sixth Man of the Year honors, joining Curt Begle (1999) and Ned Cox (2012). He came off the bench to play in all 31 games, seeing an average of 24.1 minutes per game. One of the top 3-point shooters in the MVC, Brzoja connected on 40.3% of his attempts. His top game of the year came in the exciting win at Southern Illinois as he scored a career-high 25 points. That game saw him drain nine of his 12 attempts, including four of his five triples. Those efforts saw UE overcome a late deficit to pick up an important overtime victory. Both of the honorees and their teammates are working to prepare for Arch Madness as they open up on Friday at 6:00 p.m. against either Drake or Missouri State.